Crankbaits, like the spinnerbait, are another lure made popular by bass fishermen that has proven very successful in saltwater. I've read about Redfish eating them up, and have also heard that trout and flounder will also on occasion. These are hard plastic lures equipped with treble hooks. They are usually short and stubby, and have a clear, hard plastic lip at the nose that helps them wobble and run at a certain depth. The shorter and wider lips keep crankbaits running shallow, and the thinner and longer lips get them deeper. The manufacturer will list the depths on the package. This shallow running, wobbling action is very enticing. It's easy to see why when you see mullet and other baitfish make the same surface racket as a crankbait. Most of them are equipped with rattles as well, adding to their appeal. The popular offerings in this category come from Mann’s, Rat-L-Trap, and Bandit. They come in a variety of colors, many with silver or gold sides that flash during the retrieve. Here is the Mann's Waker in the Golden Croaker color. Knowing that redfish love gold flash and seeing the wide profile of this lure, it's easy to imagine why redfish would like it. 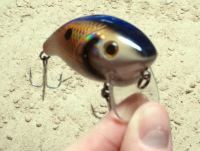 The Waker is a recent addition to my tackle box. When I think about when I'll use it, I remember the times I've waded in shallow water and come upon a grass flat where the water was about a foot deep above the grass. Or when I see baitfish activity near flooded grass. That's when I'll reach for it, and I'll probably be glad I have it. Fishing the lures is easy and they cast a mile. After the cast, they can be reeled slowly or quickly, and you'll easily see how the retrieve affects the depth and action of the lure. 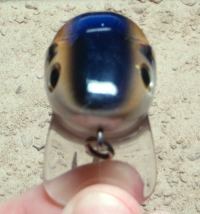 Return from Crankbaits to the Fishing Lures page.